Resurfice Corp. unveiled the Olympia IceBear, the world’s first all Stainless Steel Battery Powered Ice Resurfacer, at the 2005 annual NARCE Conference and Trade Show in Chicago, IL. The Olympia IceBear combines the Olympia’s world leading ice resurfacing technology with the IceBear cutting edge electric vehicle components. In response to an industry demand for a pollution free, safe, efficient, cordless electric powered ice resurfacer, the Olympia IceBear sets a new standard in high performance and low operational costs while producing zero emissions. The IceBear drive system and the battery system provides enough power to do more than 25 ice resurfacings between charges, far exceeding the capability of any other battery powered electric ice resurfacing machines presently on the market. 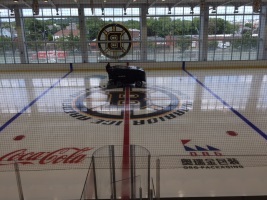 The Olympia IceBear is the latest in an ever growing Olympia line of ice resurfacing equipment from Resurfice Corp. Resurfice Corp is the leading developer of ice resurfacing technology, with Olympia ice resurfacers operating in more than 30 countries around the world.